Many blades and knives can be used for bookbinding, but the Olfa Knives in this post are a couple of my favorites. The smaller of the two, the Olfa Silver, is used for light duty cutting, which mostly consists of cutting through single sheets of paper and other thin materials. The black bar controls the position of the blade. The end opposite the blade can be clipped onto an apron pocket, so it will always be handy. 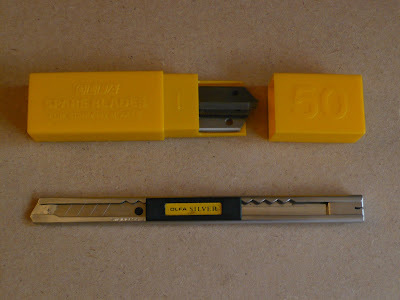 This larger blade is for more heavy duty use, similar to a box cutter. I use it for multiple-ply board, or binders board when small or detailed cuts are in order. The wheel on the right is the locking mechanism which screws into place. When I first used this knife, the locking and unlocking felt a bit cumbersome, but it is now a pretty swift learned action. The wonderful thing about both of these knives is that the blades are easily snapped off to reveal sharp new replacements. The Silver has a built-in snapping contraption and the blades of the heavy duty knife can be safely snapped off with a pair of pliers. The short clip above demonstrates this easy process. My number one rule with blades is to be careful! 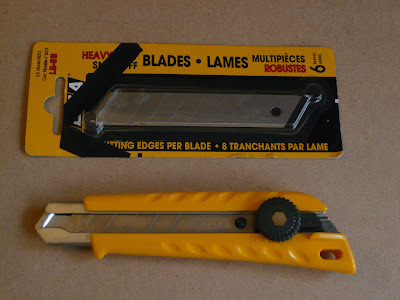 When not in use, make sure your blades are retracted, or stored in a manner that covers the blade edges. Visit the Olfa website to learn more about their variety of cutting tools. I'm sure that they'll have all sorts of great things to say about their products, my advice is to believe every word! Thanks for that great post, Monica. I love my small Olfa knife, but I don't have the larger one. After reading your post, I might have to go get myself one! I've never heard of these knives but I will give them a try...you've sold me! Thanks for the tip. Curious about your take on snap off vs replacement (like exacto) blades. Wendy & Katy, If you end up getting new knives, I hope you love them! Mindy, That's a great idea. I'll focus on that for my next post.